I think you’ll all agree with me that the Bible is the best book to use in our daily quiet time with God. After all, the Bible is truly the Word of God. Whenever we spend time in the Scriptures we are truly blessed indeed. But people often ask me, “In addition to the Bible, what is your favorite book for daily devotions?” That’s an excellent question, and one I’m always happy to answer. The truth is, there are a lot of wonderful devotionals available right now. It’s been my experience that old books are sometimes superior to the new ones. Visit a Christian thrift store or a used bookstore. Browse around until you find one that speaks to you. If it doesn’t work out, you can pass it on to a friend and look for a different resource to read. Choosing a devotional is not a lifetime choice, and chances are you’ll have more than one in your lifetime. 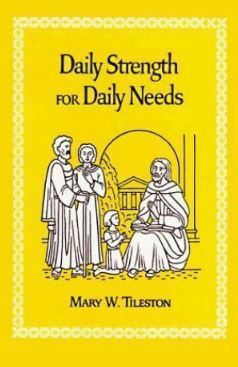 But, if you insisted that I be pinned down to choose my favorite devotional it would have to be “Daily Strength for Daily Needs” by Mary Wilder Tileston. (She also wrote another excellent devotional called “Joy and Strength.”) We don’t know very much about this author, except that she lived from 1843-1934 and that she was a voracious reader of spiritual writings. Evidently, as she read the Christian classics, she marked and took notes on the passages that moved her most. After years of study, she divided her findings into 365 readings, complete with a topical Bible passage for each day. I love the collections of Ms. Tileston, because they aren’t just the writings of one author (like so many modern devotion books are). She has read extensively and condensed the best writings of the ages down to the crème de la crème. If you’re interested in “Daily Strength for Daily Needs” you can find free version of it online by googling the title. Because it is in the public domain, there are also free Kindle versions of the book. However, I’m a big fan of having a genuine paper-and-binding book that I can hold in my hands. I’d recommend that you buy a used, hardback version of it from some online bookstore; these can be purchased very inexpensively. Whatever option or text that you choose, I would encourage you to continue to carve out time for quiet times with our Lord. St. Paul said that training in godliness has value in all things. Indeed, the time that we spend in holy reading and prayer is never wasted. 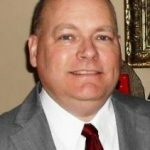 Dr. John L. Cash is the “Country Preacher Dad.” He was raised in Stuttgart, Arkansas, and has spent the last 33 years being a country preacher in the piney woods five miles south of the little town of Hickory, Mississippi. He’s a retired Mississippi public schoolteacher with grown sons, and is now a stay-at-home-grandpa with his grandson, Landon Cash. He and his lovely wife, Susan, live in a brick house in town (where we’ve had a week of gorgeous Spring weather.) 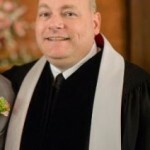 You can send him a note at brotherjohn@ilovechurchcamp.com.